NOVENA FOR THE HOLY SOULS IN PURGATORY. Another great pain of the holy souls is caused by the hideous vision of their guilt, for which they now suffer. In this life the hideousness of sin is not seen as in the life to come; and this is one of the greatest sufferings of Purgatory. O my God! Because Thou art infinite goodness, I love Thee above all things, and repent with my whole heart of my offences against Thee. Grant me the grace of holy perseverance. Have compassion on me, and, at the same time, on the holy souls suffering in Purgatory. 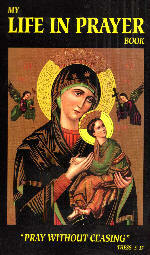 And thou, Mary, Mother of God, come to their assistance with thy powerful intercession. "Our Father," "Hail Mary," "On Thy spouses," etc. "O most sweet Jesus," etc.